CEC’s 4-131 Vibration Transducer is designed for industrial applications on fixed turbines, you can use this instrument in turbine hot sections where high temperatures cause problems with other sensors. The friction-free moving elements in CEC's 4-131 Vibration Sensors assure long life and reliability. Designed for industrial applications on fixed turbines, you can use this instrument in turbine hot sections where high temperatures cause problems with other sensors. The system is simplified due to the low impedance, high level output that can drive AC meters, recorders, and control electronics without using special amplifiers. The friction-less design also allows measurement of extremely low vibration levels, critical when monitoring precision balanced turbine systems. The low level is limited only by system noise. 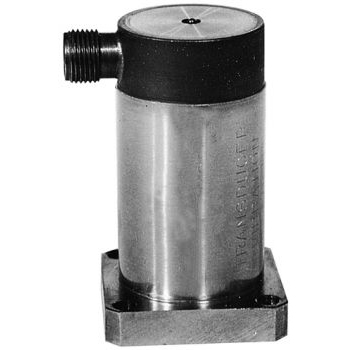 These transducers use a seismic mass magnet suspended by springs and a coil attached to the case. The output signal results from relative movement between the magnet and coil when the case vibrates. The air damped system operates above its natural frequency, so the output signal is proportional to velocity. The sealed case prevents damage to the instrument when used in difficult environments.